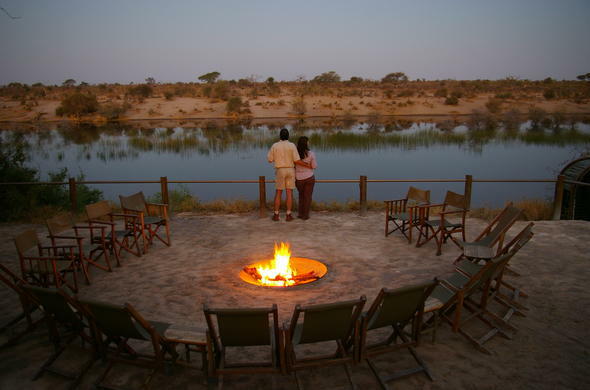 The Savute Channel rises in the Linyanti Swamps and courses through some of the driest territory in Botswana before reaching the Savute Marsh some 100 km away along its course. When the water is flowing the channel and the marsh are a dry season haven for the animals of northern Botswana. But the channel has not flowed for 25 years! "....animals come in from surrounding drylands to feed on its evergreen reedy fringes - populate the river with bream, catfish and pike, with hippos and a few crocodiles. Garnish it with water-lilies and watercress....": This is a description of Savute from three decades ago when the channel was flowing. For those who know Savute only as a dry wilderness it is difficult to imagine this picture and many do not want to it this way as it destroys the image of the Savute of today - the image of a harsh and ancient wilderness. There is the other opinion, however, that it adds to the enigma that is Savute. After crossing the Magwikhwe Sandridge, the remnant wall of an ancient lake that choked and died as the continents split, the Mababe Depression stretches ahead into the distance. It is a place of rare beauty - a place of plenty during the rainy season and a place of seeming desolation during the dry season.Some of the most dramatic images of Savute are of the contrasts between the wet and dry season - images of a desolate windswept land with animals appearing out of the dust in a frantic search for water and the lush green carpet of the marsh with huge herds of animals grazing. The Savute Marsh was a dustbowl, visibility was minimal as the wind whipped the across the landscape, the dead trees appearing as haunting apparitions. But even in this barren scene there was life. After a dry cycle of more than 25 years the Savute of today is in a wet cycle with the channel in full flow again, an event that is set to change the course of the Botswana wilderness in a dramatic way. All rivers have a source, a major highland catchment area where water from rains or springs is collected and started off on a journey to an end, spilling into another river system, or into the ocean. The river is a source of life all along its journey. There are the great rivers of Africa that are a constant source of life for the inhabitants and wildlife along their systems and there are the rivers that flow seasonally, holding water for as long as the rains dictate. The Savute does not rise in a highland mountain range, nor does it flow to the ocean. Instead it is a waterway that flows from a swamp, through some of the most arid terrain in Africa, before pouring out into a shallow depression in the sands of the Kalahari Desert.The Savute cannot be said to be seasonal, or perennial, instead wet and dry cycles alternate over undefined periods of time. A wet cycle may last ten years or half a century whereas dry cycles have been known to last for a hundred years. Here is a wilderness area that is controlled by uncertain forces.The course of the Savuti flows through ancient floodplains, signs of the area's watery past, and treacherous sands before reaching its destination at the Savute Marsh in a place known as the Mababe Depression. All along its journey through the wilderness it tantalizes but it is its destination that is legend.